The dramma serio was written during Rossini’s miraculous 21st year (1813), when he produced in total an incredible four operas. The other three (the comedies, Il signor Bruschino and L’italiana in Algeri plus the tragedy Tancredi) indicate not only the fertility of his inventive powers but also the staggering quality of his youthful composition. Rossini fans will recognise the overture to Aureliano, recycled in three other scores, most notably Il barbiere di Siviglia! The opera is set in 272 AD in the ancient city of Palmyra (modern Syria), where the queen, Zenobia (Catriona Smith), and her lover, the Persian general, Arsace (Silvia Tro Santafé), are defeated in battle by the Roman Emperor Aureliano (Kenneth Tarver). Aureliano agrees to free Arsace if Zenobia will give herself to him but she refuses, Eventually, he is won over by the lovers’ devotion, freeing them when they pledge loyalty to Rome. On the way to this happy ending, there is plenty of extreme emotion to fire-up some of Rossini’s most exciting vocal writing. This studio recording, on 3 CDs, comes with Opera Rara’s usual lavishly illustrated book, including a complete libretto with an English translation by Jeremy Commons and an article and synopsis by Richard Osborne. 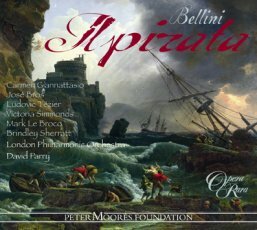 A great success in its day, Aureliano promises to thrill another generation of listeners in this new studio recording under Maurizio Benini! Booklet includes libretto in Italian with English translation. The scene is set in the Syrian city of Palmyra in the year 273 AD. The Roman Emperor Aurelian has seized Antioch but freed a number of hostages, including the Persian Prince Arsace, loyal to the Romans in the past, Publia, daughter of the Emperor Valeriano, and, Zenobia, Queen of Palmyra, whose expansionist sallies into surrounding territories have long angered the Roman leadership. Scenes 1-4. Palmyra. The great temple of Isis. Priests offer sacrifices to the gods Isis and Osiris. A shudder of the altar is taken by the High Priest to be a premonition of disaster. Zenobia and Arsace reassure the people. Arsace expresses his love for Zenobia and vows to defend her throne against the Romans; Zenobia says she will sacrifice both throne and empire to be with him. Military music is heard. The Palmyrene General Oraspe announces that the Romans have reached the banks of the Euphrates. Arsace leaves to confront the invaders. The High Priest praises his courage but reflects that no hero, however great, can prevail if Fate is against him. Roman soldiers hail their victorious emperor. Aurelian praises his men but insists that, though the world trembles before Roman might, it honours conquerors who bring peace and liberty in their wake. A defiant Arsace is brought before Aurelian who expresses pity for the young warrior. He remarks that Zenobia’s love has turned Arsace into an enemy of Rome. Scenes 8-11. The interior of a magnificent pavilion. A message arrives stating that Zenobia seeks a meeting with the Emperor. Publia is concerned by Arsace’s imprisonment. Entering in state, Zenobia makes a plea for Arsace’s release. Aurelian refuses saying that he will not free Arsace because he betrayed Rome. He appears to be smitten by Zenobia. The queen offers him gifts but Aurelian says that he will not betray his people. The prisoners plead with her but she scorns their approach, demanding instead a meeting with Arsace. Aurelian grants her request but warns that she risks total ruin. Outraged, she recalls the day when fate smiled on her country and her sword. Left alone with Publia, Aurelian concedes that Zenobia’s beauty and courage almost swayed him. Privately, Publia wonders at Aurelian’s infatuation and confesses her own love for Arsace. Scenes 12-15. A castle prison cell. Arsace laments his fate and separation from Zenobia. He is surprised by the sound of her voice; his only wish had been to see her once more before his death. He urges her not to risk her life; she counters that she could not live without him. Aurelian orders the removal of Arsace’s shackles but again demands that he forsake Zenobia. The lovers’ recalcitrance reignites his anger. As Zenobia and Arsace bid one other farewell, Aurelian vows to tame the pride of ‘this perfidious pair’. Scenes 1-4. The queen’s subterranean treasury. Palmyrene nobles are in a state of agitation. Zenobia announces that the city has fallen but again refuses to yield to Aurelian. She compares herself to Cleopatra and to Hasdrubal’s daughter Sophonisba who took poison rather than be led in triumph through the streets of Rome. Publicly Aurelian remains resolute; privately he is in thrall to Zenobia’s severity. News arrives that Arsace has been freed by Palmyrene soldiers. Zenobia is overjoyed but Aurelian warns that her joy will be short-lived. Scenes 5-8. A pleasant hill by the River Euphrates. Shepherds express gratitude for their pastoral refuge in a war-torn world. Arsace reflects that here is a place in which he would willingly dwell if Zenobia was with him. Oraspe bring news of Palmyra’s destruction. The shepherds ask Arsace to stay with them since courage cannot fight Fate. If he goes back to the battlefield he might die and lose any chance of happiness with Zenobia. Scenes 9-12. A palace atrium. Publia warns Aurelian that the people are rallying to Arsace’s cause. Aurelian confesses that his love for Zenobia is weakening his ability to resist but fresh news of the insurgency rekindles his spirits. ‘The traitor will not see the light of another dawn,’ he tells a terrified Zenobia. Once again he begs her to abandon Arsace, but Publia and Licinio urge him to hurry to battle, otherwise Arsace might win. As forces muster, Oraspe leads Zenobia to safety. Scenes 13-14. A secluded spot near the palace. A moonlit night. Arsace is in hiding, despairing of ever seeing Zenobia again. When Oraspe brings Zenobia to him, a tender reunion ensues. With troops approaching, the lovers contemplate suicide but Arsace is disarmed before he can draw his sword. Aurelian denounces Zenobia and Arsace, threatening them with life-imprisonment in separate cells. The lovers console themselves with the thought that their resistance will be an example to all Asia. Aurelian is again vexed by their resolve. Scenes 15-17 The palace atrium. Publia is distraught because Arsace does not love her and because his love for Zenobia is about to cost him his life. She determines to save him by giving him up to Zenobia’s love; as long as Arsace can survive she is prepared to suffer anything. Her plea to Aurelian is interrupted by news that the Palmyrenes are seeking mercy. He hears their plea and summons the prisoners. Reasoning that the merciful overlooking of wrongs is a form of revenge, Aurelian offers to release Zenobia and Arsace if they agree to swear eternal fealty to Rome. They accept his offer. Declaring themselves loyal Romans, they pray that the peace may return to Asia’s troubled lands. Ort der Handlung ist die syrische Stadt Palmyra 273 n.Chr. Der römische Kaiser Aurelian hat Antiochia eingenommen, aber eine Reihe von Geiseln freigelassen, darunter den persischen Prinzen Arsace, der in der Vergangenheit auf Seiten der Römer stand, Publia, die Tochter Kaisers Valerian, sowie Zenobia, Königin von Palmyra, deren Eroberungszüge in die umliegenden Gebiete den Römern schon lange ein Dorn im Auge sind. Priester bringen den Gottheiten Isis und Osiris Opfer dar. Als der Altar erzittert, deutet der Hohepriester das als Anzeichen eines nahenden Unglücks. Zenobia und Arsace beruhigen das Volk. Arsace erklärt Zenobia seine Liebe und schwört, ihren Thron gegen die Römer zu verteidigen, Zenobia sagt, dass sie bereitwillig sowohl auf den Thron als auch auf ihr Reich verzichte, um bei ihm zu bleiben. Militärmusik ist zu hören. Der palmyrenische General Oraspe verkündet, dass die Römer die Ufer des Euphrat erreicht haben. Arsace bricht zum Kampf gegen die Eindringlinge auf. Der Hohepriester preist seinen Mut, gibt aber zu bedenken, dass selbst der größte Held nicht obsiegen kann, wenn sich das Schicksal ihm widersetzt. Römische Soldaten jubeln ihrem siegreichen Kaiser zu. Aurelian dankt seinen Männern und sagt, dass die Welt vor der römischen Macht zittere, betont aber, dass sie Eroberer ehre, die Frieden und Freiheit mit sich brächten. Ein herausfordernder Arsace wird vor den Kaiser geführt, der sein Mitgefühl mit dem jungen Krieger zum Ausdruck bringt und erklärt, erst durch Zenobias Liebe sei Arsace zum Gegner Roms geworden. Die Nachricht trifft ein, dass Zenobia um ein Gespräch mit dem Kaiser ersucht. Publia ist in Sorge, da Arsace festgenommen wurde. In aller Pracht tritt Zenobia auf und bittet, Arsace möge freigelassen werden. Dieses Ansinnen lehnt Aurelian ab mit der Erklärung, Arsace habe Verrat an Rom begangen. Es hat den Eindruck, er sei er von Zenobia bezaubert. Die Königin bietet ihm Geschenke an, doch die weist Aurelian zurück und sagt, er könne sein Volk nicht verraten. Die Gefangenen versuchen, Zenobia umzustimmen, doch davon will sie nichts hören und verlangt vielmehr, Arsace zu sehen. Diesen Wunsch gewährt Aurelian ihr, warnt sie aber, dass sie Gefahr laufe, vollständig unterzugehen. Voll Zorn entsinnt sie sich der Tage, in denen das Schicksal ihrem Land und ihrem Schwert geneigt war. Als Aurelian allein mit Publia zurückbleibt, räumt er ein, dass Zenobias Schönheit und Mut ihn beinahe umgestimmt hätten. Insgeheim ist Publia verwundert über Aurelians Gefühle und gesteht, dass auch sie Arsace liebt. Arsace beklagt sein Schicksal und die Trennung von Zenobia. Überrascht vernimmt er ihre Stimme – sein einziger Wunsch war gewesen, sie vor seinem Tod noch ein letztes Mal zu sehen. Er beschwört sie, nicht ihr Leben aufs Spiel zu setzen, sie erwidert, sie könne ohne ihn nicht leben. Aurelian befiehlt, Arsaces Ketten zu entfernen, verlangt aber wieder, dass er Zenobias entsage. Die Eigenwilligkeit der Liebenden entfacht erneut seinen Zorn. Während Zenobia und Arsace sich Lebewohl sagen, gelobt Aurelian, den Stolz „dieses treulosen Paares“ zu brechen. Die Adeligen von Palmyra sind in äußerster Erregung. Zenobia verkündet, dass die Stadt gefallen ist, weigert sich aber weiterhin, sich Aurelian zu ergeben. Sie vergleicht sich mit Kleopatra und mit Hasdrubals Tochter Sophonisbe, die lieber Gift nahmen, als im Triumph durch die Straßen Roms geführt zu werden. Äußerlich bleibt Aurelian unerbittlich, insgeheim jedoch beeindruckt Zenobias Härte ihn zutiefst. Die Nachricht trifft ein, dass Arsace von palmyrenischen Soldaten befreit wurde. Zenobia ist überglücklich, doch Aurelian warnt sie, dass ihre Freude von kurzer Dauer sein wird. Hirten bringen ihre Dankbarkeit für ihre ländliche Zuflucht in einer von Krieg zerrissenen Welt zum Ausdruck. Arsace sinniert, dass dies ein Ort wäre, an dem er gerne lebte, wenn nur Zenobia bei ihm wäre. Oraspe überbringt die Botschaft, dass Palmyra zerstört wurde. Die Hirten fordern Arsace auf, bei ihnen zu bleiben, da Heldenmut nicht gegen das Schicksal ankomme. Wenn er auf das Schlachtfeld zurückkehre, liefe er Gefahr zu sterben und dadurch jedes Glück mit Zenobia zu vereiteln. Publia warnt Aurelian, dass die Bevölkerung bereit ist, sich für Arsace ztu erheben. Aurelian gesteht, dass seine Liebe zu Zenobia seine Bereitschaft zum Widerstand erlahmen lässt, aber neue Nachrichten über den Aufstand mobilisieren seine Entschlusskräfte. „Der Verräter wird keine weitere Morgendämmerung erleben“, schwört er der von Angst erfüllten Zenobia. Wieder beschwört er sie, sich von Arsace loszusagen, Publia und Licinio hingegen drängen ihn, in die Schlacht zu ziehen, sonst könnte Arsace den Sieg davontragen. Während die Truppen sich sammeln, bringt Oraspe Zenobia in Sicherheit. Arsace hat sich versteckt, er beklagt sein Los und glaubt, er werde Zenobia niemals wieder sehen. Als Oraspe Zenobia zu ihm bringt, folgt ein zärtliches Wiedersehen. Da die Truppen näher rücken, überlegen die Liebenden, Selbstmord zu begehen, doch Arsace wird entwaffnet, ehe er das Schwert ziehen kann. Aurelian schmäht Zenobia und Arsace und droht, sie für den Rest ihres Lebens in getrennte Zellen zu sperren. Die Liebenden trösten sich mit dem Gedanken, dass ihr Widerstand ganz Asien ein Beispiel setzen wird. Aurelian gerät ob ihrer Entschlossenheit wieder in Rage. Publia ist zutiefst bekümmert, weil Arsace sie nicht liebt und weil seine Liebe zu Zenobia ihn das Leben kosten wird. Sie beschließt, ihn zu retten und ihn Zenobia zu überlassen, denn solange er am Leben bleibt, ist sie zu jedem Opfer bereit. Noch während sie Aurelian flehend diesen Entschluss mitteilt, trifft die Nachricht ein, dass die Palmyrer um Gnade bitten. Der Kaiser hört die Menschen an und lässt die Gefangenen kommen. Mit der Rechtfertigung, dass das gnädige Übersehen von Fehlern eine Art Rache darstellt, erklärt Aurelian sich bereit, Zenobia und Arsace freizusetzen, wenn sie Rom ewige Treue schwören. In diesen Vorschlag willigen sie ein, erklären sich zu loyalen Römern und beten, dass wieder Friede in die zerrissenen Länder Asiens einkehren möge. La vicenda si svolge nella città siriana di Palmira, nell’anno 273 d.C.
L’imperatore romano Aureliano ha conquistato Antiochia, ma ha liberato alcuni ostaggi, tra cui il principe persiano Arsace, in precedenza alleato dei Romani, Publia, figlia dell’imperatore Valeriano, e Zenobia, regina di Palmira, le cui mire espansionistiche sui terreni circostanti da lungo tempo irritavano la supremazia romana. Scene 1-4. Palmira. Gran tempio d’Iside. Mentre i sacerdoti offrono sacrifici alle divinità Iside e Osiride, l’altare trema e il Gran sacerdote, spaventato, teme che questo sia presagio di una nuova sciagura. Zenobia e Arsace rassicurano il popolo. Arsace dichiara il proprio amore per Zenobia e giura di difendere il suo trono contro i Romani; Zenobia replica di essere disposta a sacrificare trono e impero per lui. Risuona una musica militare. Oraspe, generale di Palmira, annuncia che i Romani hanno raggiunto le rive dell’Eufrate. Arsace si allontana per affrontare gli invasori. Il Gran sacerdote elogia il suo coraggio ma aggiunge che nemmeno un grande eroe può lottare contro il fato avverso. I soldati romani salutano l’imperatore vittorioso. Aureliano elogia i suoi uomini e aggiunge che il mondo trema davanti alla Potenza romana, ma ama i conquistatori che concedono pace e libertà ai vinti. Al suo cospetto viene condotto Arsace che gli manifesta disprezzo. L’imperatore commisera il giovane guerriero e osserva che l’amore per Zenobia lo ha trasformato in un nemico di Roma. Scene 8-11. L’interno di un magnifico padiglione. Arriva un messaggio di Zenobia che chiede un incontro con l’Imperatore. Publia è preoccupata perché Arsace è stato imprigionato. Arriva Zenobia in pompa magna, e supplica l’imperatore di liberare Arsace. Aureliano rifiuta: non intende liberare Arsace perché ha tradito Roma, ma sembra colpito da Zenobia. La regina gli offre dei doni, ma Aureliano ribatte che non intende tradire il suo popolo. Alle suppliche dei prigionieri Zenobia risponde con freddezza e chiede di vedere Arsace. Aureliano accetta la sua richiesta, ma l’avverte che potrebbe rischiare la propria rovina. Sdegnata, la donna rievoca il tempo in cui il destino sorrideva al suo paese e alla sua spada. Rimasto solo con Publia, Aureliano ammette che la bellezza e il coraggio di Zenobia gli hanno fatto quasi cambiare idea. Rimasta sola, Publia dubita che Aureliano sia innamorato della regina e confessa il proprio amore per Arsace. Scene 12-15. Una cella nella prigione del castello. Arsace lamenta il proprio destino e la separazione da Zenobia. Lo sorprende sentire il suo della voce di lei: il suo unico desidero era di rivederla ancora una volta prima di morire. La sollecita a non rischiare la sua vita; lei replica che non può vivere senza di lui. Entra Aureliano e ordina che di togliere le catene ad Arsace ma gli chiede ancora una volta di abbandonare Zenobia. Il rifiuto degli innamorati riaccende la sua ira. Mentre Zenobia e Arsace si dicono addio, Aureliano giura di vendicarsi di entrambi. Scene 1-4. I sotterranei dove la regina conserva i suoi tesori. I nobili di Palmira sono in agitazione. Zenobia annuncia che la città è caduta ma ancora una volta rifiuta di arrendersi ad Aureliano. Si paragona a Cleopatra e a Sofonisba, figlia di Asdrubale, che si erano avvelenate pur di non essere trascinate in trionfo per le strade di Roma. Aureliano rimane all’apparenza risoluto; in privato è disarmato dalla severità di Zenobia. Arriva la notizia che Arsace è stato liberato dai soldati di Palmira. Zenobia è sopraffatta dalla felicità, ma Aureliano la avverte che la sua gioia sarà di breve durata. Scene 5-8. Una ridente collina sulle sponde dell’Eufrate. Pastori e pastorelle esaltano il loro ambiente bucolico, dove la discordia e la guerra non hanno posto. Arsace medita che gli piacerebbe vivere qui se Zenobia fosse con lui. Arriva Oraspe e annuncia la rovina di Palmira. I pastori invitano Arsace a rimanere con loro: il coraggio non basta per lottare contro il Fato. Se ritornerà sul campo di battaglia potrebbe morire e perdere ogni possibilità di essere felice con Zenobia. Scene 9-12. L’atrio di un palazzo. Publia avverte Aureliano che il popolo si sta radunando al fianco di Arsace. Aureliano confessa che il suo amore per Zenobia indebolisce la sua capacità di resistere, ma le ultime notizie sulla rivolta riaccendono il suo coraggio. A Zenobia, inorridita, dichiara che il traditore Arsace non vedrà la luce del nuovo giorno e la supplica ancora una volta di abbandonarlo. Publia e Licinio lo sollecitano ad affrettarsi sul campo di battaglia per scongiurare la vittoria di Arsace. Mentre si raduna l’esercito, Oraspe conduce Zenobia al sicuro. Scene 13-14. Luogo solitario vicino alla reggia. Notte di luna. Arsace si nasconde e teme che non potrà più rivedere Zenobia. Oraspe la conduce a lui per una tenera riunione. Si avvicinano le truppe e gli innamorati meditano il suicidio, ma Arsace viene disarmato prima di poter sguainare la spada. Aureliano dichiara che Zenobia e Arsace non sono degni di morire e li minaccia di imprigionarli per sempre in due celle separate. Gli innamorati si consolano al pensiero che la loro resistenza sarà un esempio per l’Asia intera. Aureliano è ancora una volta tormentato dalla loro decisione. Scene 15-17 L’atrio del palazzo. Publia è disperata: Arsace non l’ama e la sua passione per Zenobia può costargli la vita. Per salvarlo, Publia è disposta a rinunciare a lui e a soffrire qualunque dolore. Chiede clemenza ad Aureliano, ma viene interrotta dall’ingresso dei Grandi del regno che si prostrano davanti all’imperatore. Aureliano ascolta la supplica e convoca i prigionieri. Ragiona tra sé che dimenticare generosamente i torti è una degna vendetta, e si dice disposto a lasciare liberi Zenobia e Arsace se accettano di giurare fedeltà eterna a Roma. I due accettano e si dichiarano Romani, con l’auspicio che la pace ritorni nelle terre afflitte dell’Asia. L’action se déroule en Syrie, dans la ville de Palmyre, en l’an 273. Après la prise d’Antioche, l’empereur romain Aurélien a libéré un certain nombre d’otages, dont le prince persan Arsace, ancien allié des Romains, la fille de l’empereur Valérien, Publia, et la reine de Palmyre, Zénobie, dont les incursions expansionnistes dans les territoires voisins exaspèrent Rome depuis longtemps. Scènes 1–4. Palmyre. Le grand temple d’Isis. Des prêtres se livrent à des sacrifices en l’honneur d’Isis et d’Osiris. Un frémissement de l’autel est interprété par le Grand Prêtre comme le signe prémonitoire d’une catastrophe. Zenobia et Arsace rassurent le peuple. Arsace dit son amour pour Zenobia et jure de défendre son trône contre les Romains ; Zenobia répond qu’elle est prête à sacrifier son trône et son empire pour lui. Une musique militaire se fait entendre. Le général palmyréen Oraspe annonce que les Romains ont atteint les rives de l’Euphrate. Arsace part livrer bataille aux envahisseurs. Le Grand Prêtre loue son courage, mais reconnaît que nul héros, aussi grand fût-il, ne saurait vaincre si le destin est contre lui. Les soldats romains acclament leur empereur victorieux. Aureliano félicite ses hommes en leur rappelant que si la puissance de Rome fait trembler le reste du monde, il incombe aux conquérants de lui apporter paix et liberté. Un Arsace rebelle comparaît devant Aureliano. L’empereur lui manifeste sa pitié et regrette que l’amour de Zenobia ait fait de lui un ennemi de Rome. Scènes 8-11. L’intérieur d’un magnifique pavillon. Zenobia a envoyé un message pour demander audience à Aureliano. Publia s’inquiète de l’emprisonnement d’Arsace. Zenobia entre en grande pompe et plaide pour la libération d’Arsace. Aureliano refuse de le libérer parce qu’il a trahi Rome. L’empereur semble épris de la reine. Malgré les offrandes de celle-ci, il déclare qu’il ne trahira pas son peuple. Les prisonniers supplient Zenobia de se soumettre, mais elle refuse avec hauteur et demande à voir Arsace. Aureliano lui accorde cette faveur, en la prévenant qu’elle risque de tout perdre. Blessée dans son orgueil, elle évoque le temps où le destin souriait à son royaume et à son armée. Une fois seul avec Publia, Aureliano reconnaît qu’il a failli céder devant la beauté et le courage de Zenobia. En privé, Publia s’étonne de l’admiration qu’Aureliano porte à Zenobia et avoue, elle-même, aimer Arsace. Scènes 12-15. Une cellule de prisonnier. Arsace se lamente de son sort. Il souffre d’être séparé de Zenobia et espère la revoir une dernière fois avant de mourir. Il sursaute au son de sa voix. Il la supplie de ne pas risquer sa vie, mais elle lui répond qu’elle ne saurait vivre sans lui. Aureliano ordonne qu’on ôte les chaînes du prisonnier et lui enjoint à nouveau de renoncer à Zenobia. Aureliano fulmine devant ces deux amants qui refusent de se soumettre. Tandis qu’ils se disent adieu, Aureliano jure de dompter l’orgueil de ce couple perfide. Scènes 1-4. Le souterrain abritant la salle du Trésor de la reine. La noblesse palmyréenne est en émoi. Zenobia annonce que la ville est tombée aux mains des Romains, mais refuse toujours de capituler devant Aureliano. Elle se compare à Cléopâtre et à la fille d’Hasdrubal, Sophonisbe, qui s’est empoisonnée plutôt que de se laisser parader, vaincue, dans les rues de Rome. En public, Aureliano ne fléchit pas ; en privé, il est sous le joug de Zenobia. On vient annoncer qu’Arsace a été libéré par des soldats palmyréens. Zenobia jubile. Aureliano la prévient que sa joie risque d’être brève. Scènes 5-8. Un coteau riant en bordure de l’Euphrate. Des bergers vantent les mérites de ce refuge pastoral loin des ravages de la guerre. Arsace déclare qu’il y vivrait volontiers si Zenobia était à ses côtés. Oraspe vient lui annoncer la destruction de Palmyre. Les bergers supplient Arsace de rester. Le courage, disent-ils, ne peut rien contre le destin ; et s’il meurt au combat, il perdra toute chance de bonheur avec Zenobia. Scènes 9-12. L’atrium du palais. Publia prévient Aureliano que le peuple soutient Arsace. Aureliano avoue que son amour Zenobia affaiblit sa capacité de résister, mais les dernières nouvelles de la rébellion ravivent son courage. Le traître ne reverra pas le jour se lever, déclare-t-il alors à une Zenobia terrifiée. Il lui demande, une fois de plus, de renoncer à Arsace, mais Publia et Licinio le pressent de partir au combat de crainte qu’Arsace ne gagne. Tandis que les combattants se rassemblent, Oraspe vient chercher Zenobia pour la mettre en sécurité. Scènes 13-14. Un endroit isolé près du palais, au clair de lune. Arsace se cache. Alors qu’il désespère de ne jamais revoir Zenobia, elle arrive sous la protection d’Oraspe pour des retrouvailles émouvantes. À l’approche de l’ennemi, les amants contemplent le suicide mais Arsace est désarmé avant d’avoir pu tirer son épée. Aureliano accuse Zenobia et Arsace, et les menace de les emprisonner séparément à vie. Les amants se consolent en se disant que leur résistance servira d’exemple à tout l’Orient. Aureliano est, à nouveau, contrarié par leur obstination. Scènes 15-17 L’atrium du palais. Publia est bouleversée de voir qu’Arsace ne l’aime pas et que l’amour qu’il porte à Zenobia risque de lui coûter la vie. Elle décide de le sauver en renonçant à lui : elle est prête à toutes les souffrances pourvu qu’Arsace vive. La capitulation des Palmyréens est annoncée alors qu’elle s’emploie à plaider la cause du prince auprès d’Aureliano. Celui-ci l’écoute et fait comparaître les prisonniers devant lui. Se disant que leur pardonner généreusement leurs torts est une forme de revanche, il offre la liberté à Zenobia et Arsace à condition qu’ils jurent éternelle allégeance à Rome. Ils acceptent. Se déclarant loyaux envers Rome, ils prient pour le retour de la paix dans l’Orient déchiré.